Heat juice or cider with cinnamon syrup in a saucepan on the stove. Portion into mugs (leaving plenty of headroom for whipped cream!). Top with whipped cream and a drizzle of caramel syrup. To mull your cider, simply place juice and spices together in a saucepan. Bring to a boil, then reduce heat and simmer for 10 minutes. Your house is going to smell ah-MA-zing! Strain spices from juice (careful! Don’t burn yourself!) 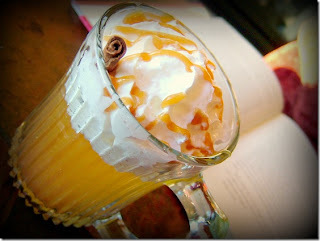 and proceed with caramel apple cider recipe. You can easily serve this beverage for a party. To do so, simply keep the cider/cinnamon syrup mixture warm in a crockpot and let guests serve themselves with a ladle. Serve chilled whipped cream on the side, and offer a squeeze bottle of caramel syrup for drizzling!